On April 27, 2018, Ambassador Liu Xiaoming met with Katharine Viner, Editor-in-chief of the Guardian. Paul Johnson, Deputy Editor, Jamie Wilson, Head of International News, and Tania Branigan, Leader Writer, and Chen Wen, Minister Counsellor of the Chinese Embassy were present. Ambassador Liu said that, in recent years, the Guardian has paid growing attention to China and China-related reports, covering all aspects of China, such as politics, economy, diplomacy, science, education, culture, society, and people's livelihood. 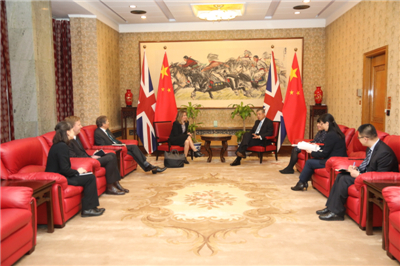 He expressed the hope that the Guardian, as a mainstream newspaper with important international influence, would report on China in a more comprehensive, objective, and impartial manner and act as a bridge in deepening understanding and knowledge of China in the UK and around the world, so as to present a complete and true picture of China to its readers. Ms. Viner said that with the rapid development of China's economic, science, technology, and cultural industries and the continuous increase of its international influence, the outside world needs to have a more comprehensive understanding of China. The Guardian, attaching great importance to reporting on China, will increase the number of journalists in China and further expand the scale of China-related reports, so as to give its readers a more comprehensive picture of China. Ambassador Liu also shared his views on China-U.S. trade disputes, China-UK relations and the situation on the Korean Peninsula with the guests.